We are sad to report the death of William (Bill) Cutler, Cottingley Hall Estate’s longest standing resident, aged 99. After service in the Royal Navy, Bill moved to Cottingley shortly after the end of the Second World War. Amid a housing shortage, pre-fabricated homes were quickly built at Cottingley and Bill was one of the first tenants in 1947. In the 1970s the pre-fabs, which were only designed to last ten years, were demolished and a new estate was built. Bill reluctantly left his pre-fab for a new house in 1972, where he lived the rest of his life. Two years ago Bill was one of 21 veterans from across the north of England awarded the Légion d’Honneur – France’s highest honour – for their role on D-Day, the allied invasion of Normandy. 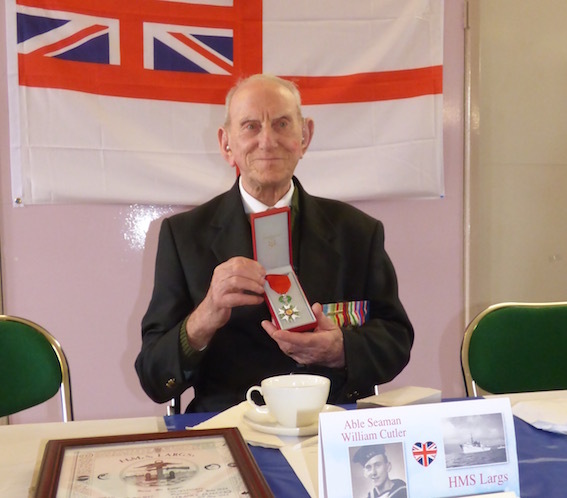 Bill was a Royal Navy sailor on board HMS Largs. This was no ordinary ship, in fact it was a captured French Banana boat that had been converted to be used as the Combined Operations Headquarters. It served this function at all the major allied sea-borne invasions of the Second World War. Bill Cutler served on HMS Largs through the invasions of North Africa in 1942; Sicily in 1943, France in 1944 and Burma in 1945. On D-day the ship, with generals and admirals on board, led the invasion force that landed at Sword Beach. Bill was a bridge lookout and helped to avert catastrophe when he spotted a torpedo launched at the ship. Bill’s war record was commemorated by the people of Cottingley in April 2016 when they held a special party in his honour. The event, at Cottingley Community Centre, took the form of a 1940s style tea dance. The centre was decked out in union jack bunting and archive newspapers from the war were on show. Many people had dressed in 1940s style with tea being served by a squad of ‘Land Girls’. Bill was a regular at Remembrance Day events on the estate and visited the primary school to talk about his experiences.